Operating System Windows, Win VISTA, Mac OS, Linux (Note: The driver CD is applied for Windows system only). 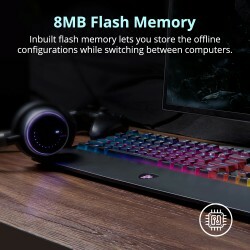 1.Is it possible to memorize the keyboard backlight once reset the PC? Yes, with the inbuilt 8MB flash memory, TK09R mechanical keyboard can also let you store macro settings as well. 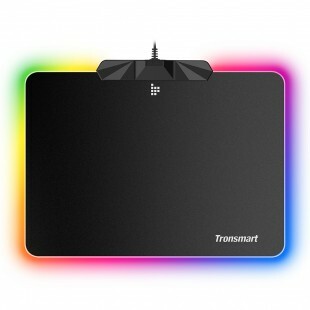 2.What is switch does Tronsmart TK09R use? 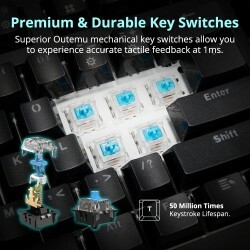 It’s built with Outemu blue switches, enables you to experience accurate tactile feedback at 1ms. 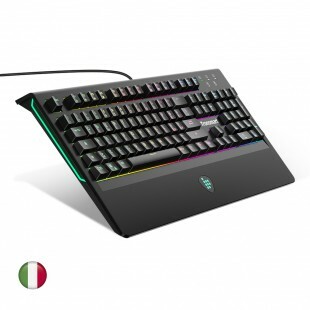 3.Does this keyboard work with windows 7 or above? It does. 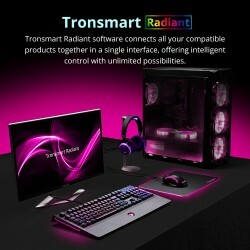 This is a plug-and play keyboard with Tronsmart Radiant software, and this driver can only be used under Windows system. 4.Are the switches of this keyboard pluggable? Can I replace them by myself? It is a soldering type switch that’s not pluggable, and you need to have professional tools to replace it. 5.How many keys are programmable with Tronsmart Radiant Software? Every key on the keyboard are programmable. Each and every individual key can also be customized to an action being assigned. 6.What is full key rollover? 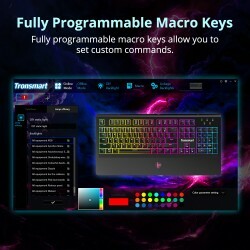 Our Tronsmart TK09R RGB mechanical keyboard can detect up to 105 keys (Spanish/Italian Layout) which means that if you simultaneously pressed every standard key on our keyboard. All keys will be registered correctly. This is important in games where improper detection of keystrokes can make the difference between victory and defeat. 7.Is there a shortcut to lock the Windows Key? Yes, lock it by simply pressing FN+Windows. 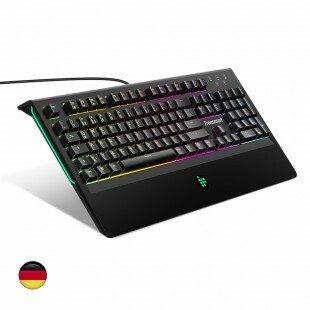 8.Is It Possible to use the keyboard without any software installation? Yes. 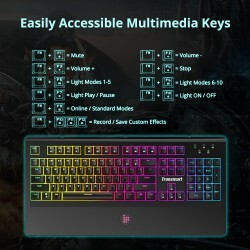 This means you will not be able to choose more lighting effects but the 10 backlight effects by pressing FN+F5/F6, or assign any type of action to the keys. The firmware will also need to be updated on the keyboard as well. 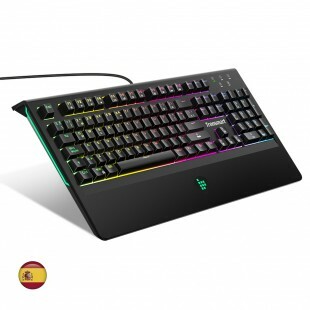 I find this keyboard for gaming, it has RGB light effect which is cool. It is blue switch, loud and precise. You also can download a software about Marco and light control on their website. Finally, it is a good mechanical keyboard at this price. Recommended by one of my close gaming friends. Never had a mechanical gaming keyboard before. This one looks cool cause you get to choose the pattern of the lights. I think it has like 10 different of them. Since this is my very first mechanical keyboard, I couldn't make many comparisons to other similar keyboards from other brands. Overall, I like the color of it. The sounds of typing are not too loud, it is ok for me. The only thing is that I wish the letter on each button could be nicer. As a programmer and gamer, this keyboard is perfect for me. The clicky sound might be annoying for others. But working at home, this keyboard sound is exactly what I want. I can hear it exactly when I pressed the key. That way I won't worry about accidentally pressing a key and ruined my whole program. This also works out well for gaming as I don't have to worry about whether I've pressed the key during the gaming session. The key switch is very light when typing. This key switch is also very good for gaming as I won't have to worry about hard pressing it. Lastly, the RGB lighting works out well with my case to create the neon aesthrtic. I was a bit skeptical never hearing of the brand before, but figured I would give it a shot. 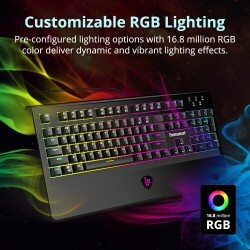 The RGB colors are awesome key respond and anti-ghosting is great, this keyboard is very comparable to the razer and Corsair k70 in size and style. It’s a little louder then my Corsair k70 but if you are buying a mechanical keyboard to not be loud then you’re looking at the wrong keyboard. On how many keyboards can you play snake with leds?! YES, this keyboard's leds are so fun to toy with. If you don't know how to do it, do Fn+F6 combination, and when you get to the last mode of that shortcut (number keys lighting up) press Fn+Enter and you'll start playing snake ON YOUR KEYBOARD :D You control it with arrows, and it's such a fun thing to build in into led keyboard. Now onto the review, if leds are your thing, this keyboard is going to be FUN. 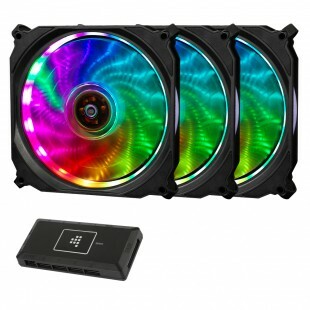 There's at least 14-15(that I found) built in modes for lights, one of them is for when you have music playing and want leds to play with music as well. You can customize everything tho, program for it comes on a disc (I downloaded it online tho) and there are tuns of stuff you can play around with. 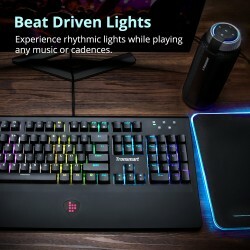 I use keyboard primarily for gaming (league of legends mainly, sometimes overwatch) and there are built-in modes to have important keys for those games to light up. Response times are great, my hand is comfortable during games, I got used to it in no time at all. I've been using it over a month to regularly play, and I've had no problems so far. Anyway, great keyboard, really good addition to my set-up. 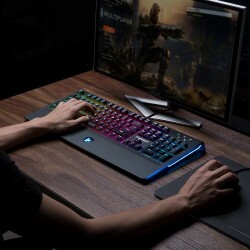 Colors are amazing, easy to set a custom settings this keyboard doesn't slip around and I can easily see the keys in the dark, the detachable hand guard is a plus and doesn't impede my use of the keyboard. Overall, I’d say this keyboard is a very good buy. 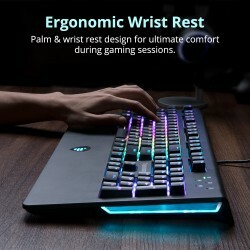 The Light Up Keyboard is Great for gaming and it has everything thing you would want in a keyboard, form the little stands at the front to the Wrist Bar underneath it's truly a great appliance. Although many seem to like wireless (for the reduced clutter and all) the wires are partly imbedded in the key broad so the clutter is less exposited. Just what I needed to complete my gaming set up and Editing station. I like the options it has for the different lighting pulse/music/wave and many others. It did take sometime to getting use to since I replaced the iMac keyboard with a windows keyboard. I believe everyone should own this keyboard, period. I received Last Tuesday and I am. extremely happy with it. It's beyond amazing. The feel is amazing. Not all the keys feel the same, but keys such as the space bar and the enter key feel no as clicky, but both feel are satisfying. I 100% recommend this keyboard. The lights are perfect. just fine. I had a Logitech gaming keyboard (mechanical and nonmechanical) and by far this is the best keyboard I have ever own. This could change in a few days if this keyboard breaks on me or something unexpected happens to it, but so far, I am in love. The price is something that also makes this keyboard worth the money. I bought the Black one (because of my setup) and stands out incredibly. The sound wheel is a huge +. I believe everyone should own this keyboard, period. Mechanical, check! Awesome LEDness? Check! The colors are vivid. In the darkness, it’s more than enough to see what you’re doing. In the light, still very cool and very visible. But I want to sleep sometime, I hear you say. No problem. Just a click of the function key and you've turned off the lights. It’s there when you want and not when you don’t. Exactly what a fancy-pants gaming keyboard should do. Second, let’s discuss the mechanical nature. If you want a quiet keyboard this is not for you. Why? Because all mechanical keyboards have switches in them, that digitize your punching the keys. Good keyboards have dedicated switches for each and every key. This keyboard has blue switches and they’re great. Responsive keys are the name of the game with gaming boards and this one is very responsive. 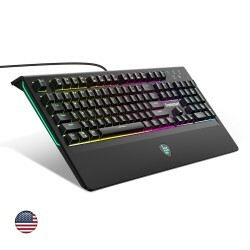 Clicking and clicking like a good mechanical keyboard should, it feels sturdy, and feels like it’s gonna get me exactly what I want to be done, whether typing a paper or sniping xxxN00b5auce69xxx in a shooter. It’s good. It has a solid build. I feel like the internals are well worth the money. The most obvious to gamers, is to be able to create and execute macros. What this is, is to set one key or a combination of keys, to do a string of commands or keystrokes that are tied to your macro. This can do that. In fact, it’s not difficult at all. That’s really nice. Next, obviously, it’s backlit, which means without other lights, you can get your game on in the dark without waking your roommate/spouse. The clickety-clack is something else though. Finally, with the blue switches, it’s a known quantity when you press. If you click, it gets executed. No worries about “did I get the shot off”. You did. You know because of the reassuring click. Just like any good arcade game button, that click means the button was pressed and you know the digital signal was sent. Overall this keyboard rocks and I think it’s going to put me over the top in my next gaming session. I tend to play Starcraft and RPGs, not so many shooters, but it’s awesome for SCII with the macros. I can’t wait to play. No joke. I’m happy with my purchase and definitely would recommend this to any gamer looking to upgrade his or her rig. I had many experiences with the keyboard, wireless portable one, and tablet keyboard, surface pro keyboard things like that. However, none of those keyboards I had can be compared with this product. The term mechanical is so accurate to describe this keyboard. The key and the frame are solid and beatable. 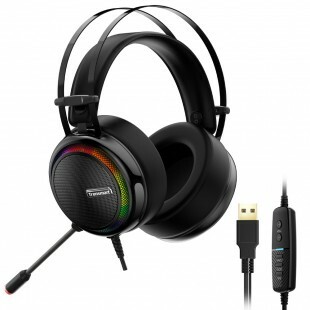 It will stand for a long period of gaming or even working purpose. Also, those LED light is quite fun looking. I may purchase another one for my cousin. This keyboard is great! It is fully functional and feels great when pressing the keys. It makes a satisfying click and it the weight of the keys also feels good. It could be a little loud if you are not used to having a mechanical keyboard, but that is what you should expect when purchasing. The biggest feature is the backlight. It looks great and is bright. You can change the different settings to the rainbow, green, and other different combinations. It also is very ergonomic and looks great. The construction is quality and so is the packaging and box. It is very well put together. No issue installing, it was just plugged and play but it also comes with instructions and some drivers on a mini CD. 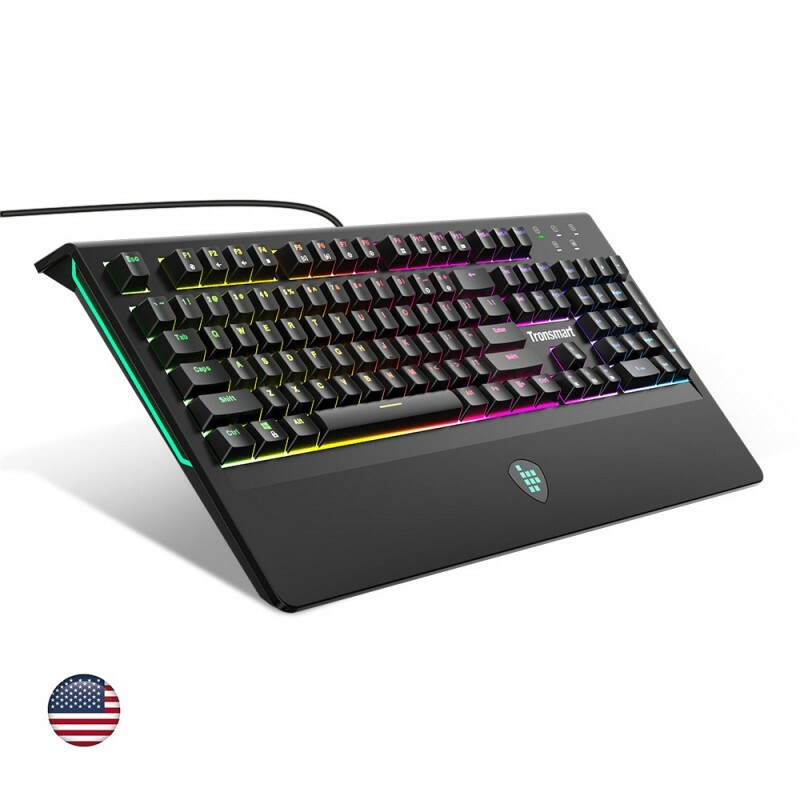 If you want a mechanical keyboard this is for you. I really like this keyboard. 1. This is a full 104 keys keyboard. this keyboard includes a number pad. I used the number pad for the calculator and many tasks. I really like the full 104 keyboard. 2. This is a mechanical keyboard. Some people may feel awkward when they use the mechanical keyboard. After I tried to type in the mechanical keyboard, I can not go back to the slim keyboard. 3. 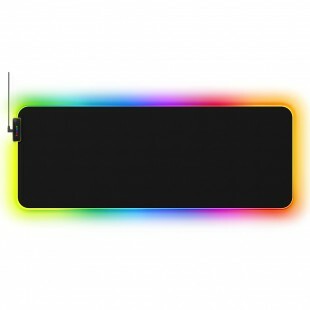 The LED backlight is very cool. It also has many patterns for the LED light. this keyboard is MX blue. the sound of press keyboard is a little bit loud. If the quiet environment is your priority, then this keyboard may not fit your needs. I really enjoy this press keyboard sound. Other name brand has the different type of quiet switch, but the product is double or even triple. for my budget choice, this is a good keyboard. Overall, I really love this keyboard. 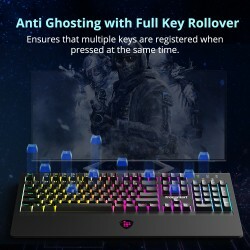 I was looking for a gaming keyboard with programmable buttons and I've found this one. In my opinion, the most important thing on the keyboard is the visual side and workable buttons (other functions) for gaming/typing. So, I think that both of these things actually are in this mechanical keyboard. Also, I like that it has terrific programming features, it is easy to use and there is some fast access hot buttons that are very comfortable to use. Integrated media controls are awesome, when I was going to buy it I didn't know how it would work, but after I've tried it, I got a lot of pleasure. I'm gamer so, for me, it's important to have a keyboard with crisp, responsive keystroke. It turned out just the way it should be. As I said before, the visual side is very important so I think that lighting is attractive and versatile. Also, it has a beautiful design, that makes it more special. In general, it is well-built and attractive. I love this keyboard, it is amazing.